I realized I have not talked about any food I have made lately and with the tomato avalanche that is going on at our place I figured I would share the latest tomato soup recipe. This actually stemmed from my mother’s arrival the weekend of July 4th with a pile of veggies from her North GA garden. We ate what we (or, I should say I ate, since The Mister shuns most veggies) could before it was time to start coming up with ways to put up the rest before it spoiled. The freezer is full of bags of shredded zucchini and jalapeño peppers, and we just finished up the onions. Everything was delicious and much appreciated, but I had one dilemma regarding all the tomatoes. As many of you know, when you grow tomatoes, unless you can them or gift them to others sooner or later you are going to have way more than you can eat in a timely manner. This happened with roughly a large Ziplock bag full of tomatoes. In desperation to keep them for a later use I threw the bag in the freezer and hoped for the best. I figured I would come up with a way to use them before they took on a funny “came from the freezer” taste. Well this is the recipe was just the trick. Squeeze the tomatoes right out of their skins into a large saucepan. Add the spices, broth and tomato paste and bring to a boil, stirring occasionally. Once it comes to a boil turn it down to simmer for about 15 minutes. Let cool and then run through a blender or food processor until smooth. Poor back into the pan, add the milk and adjust the spices until you get exactly the consistency and flavor you are looking for. Simmer on low, stirring occasionally, for another 15 to 20 minutes. Serve it up with parmesan cheese sprinkled on top. 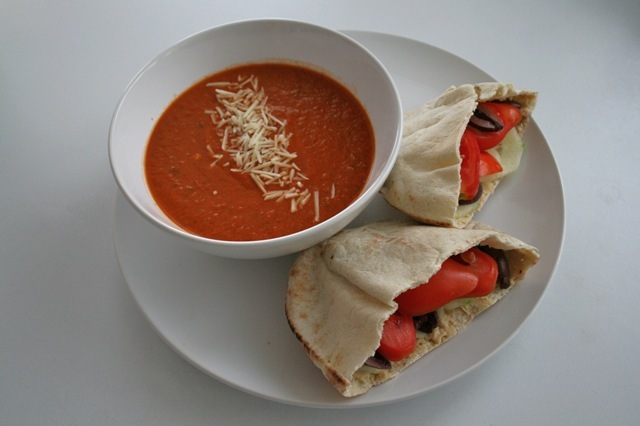 My homegrown and homemade soup along with a veggie pita, bursting with more homegrown tomatoes and homemade hummus. All of this displayed on my new IKEA dinnerware in white. Hope you all are enjoying as much homegrown veggies as possible this summer!